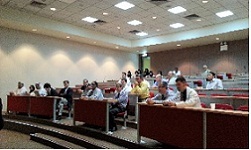 According to the Ministry of Economy, Trade, and Industry’s strategy in 2012 to promote the medical equipment and services in overseas, Med in Japan hosted the seminar in UAE on 19 March 2013. 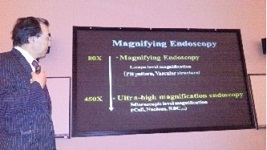 The presentation was made by Professor Shinei Kudo, the world leading expert on endoscopic examination and bowel cancer. Since the bowel cancer ranks the top of the cancer death rate in UAE, a number of medical experts in UAE had enthusiastically participated in this event and further discussed regarding the bowel cancer treatments. It seems that they highly expected Japanese leading-edge diagnostic technology and medical equipment in UAE. Med in Japan is willing to lead some more activities to promote the bilateral development on healthcare exchange between UAE and Japan.